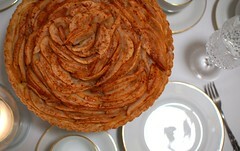 What happens when you have an extra batch of pâte sablée and 6 pounds of bosc pears? Make a pear tart. This past weekend was my mother’s 60th birthday. By default, I was to show as chef for the dinner. 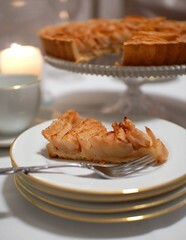 This pear tart made for an excellent dessert. The recipe is terribly simple. Really, it is. All you need is a batch of pâte sablée (or store-bought pie crust, although a crumbly sandy crust goes better with the softened fruit) and about 5 or 6 bosc pears (you can use any other slightly under-ripe pear, but the texture of bosc seems to hold up the best). 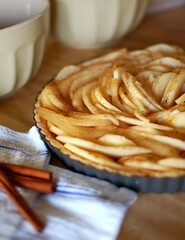 Sprinkle half of the sugar, ground cinnamon and ground ginger evenly over the bottom of the crust. Starting from the outer circular rim and working in, slice by slice, line the tart shell with slices of pears, packing the slices in as tightly as possible. Insert the small and oddly shaped end cuts to fill any gaps. You should be able to fit at least 5 pears worth of slices into the pan, if not more. Sprinkle the remaining sugar, ground cinnamon, and ground gingerly over the top of the pears and dot with the cubes of butter. Bake the tart for 45-55 minutes. Cool on a rack long enough to remove the tart from the pan. Serve immediately warm, or let it cool completely. 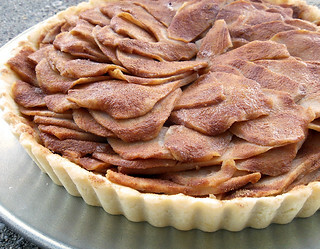 The benefit to letting it cool is that the pears will set and the tart will be easier to cut neatly. This is a simple recipe that is extremely versatile. The butter is thoroughly mixed in for the crust which makes the crust tender, yet crispy. The dough is crumbly, so instead of rolling it, you can simply press it into the pan. It must be docked and par-baked, but weights aren’t required. Combine first four ingredients in a food processor until thoroughly mixed. Pulse and add in the butter one cube at a time, the egg, and a pinch of salt. Pulse until the mixture reaches a loose crumbly state, like slightly humid sand. If the mixture is too dry, add ice cold water, by the tablespoonful, until you achieve the right consistency (you shouldn’t need more than 2 tablespoons of water at the most, if any). Form the dough into a patty. Cover tightly with plastic wrap and chill for at least an hour before baking. The dough can also be double wrapped in plastic and frozen for up to 1 week. When ready to bake, preheat oven to 350 degrees F. Press the chilled dough into a 9″ tart shell pan. Put the pan with the dough pressed in it back in to the refrigerator, loosely covered with plastic, and chill for another 30 minutes. Bake for 15-17 minutes, carefully monitoring the shell so that the edges do not burn. Let the crust cool on a rack before filling. ~ by ulterior epicure on November 7, 2007. @Sara-Jane: Gorgeous! I’m so glad you liked it! Nice blog! !thanks for this great article.